Moles are common and mostly harmless. Moles that appear during adulthood are also normal. But what if a mole starts to change? Moles, also called nevi (plural), are one of several harmless skin lesions that can appear on the body. These are often brown, slightly raised spots on the skin. They can also be flat, round, and colored differently. Some have hair and can change in appearance over time. Moles appear because some cells called melanocytes in the skin grow in a cluster. Melanocytes are responsible for our skin color. They appear on different parts of the body including the scalp and under the nails. A common mole is usually 5 mm in diameter. What are the types of moles? 1. Atypical or dysplastic mole is slightly larger than regular moles. It has a different shape and often has more than one color. It can be mistaken for melanoma, so you will need to consult a dermatologist. 2. Spitz mole also looks like melanoma. They are usually raised, domed and pink in color. They often appear during childhood and adolescence. 3. Congenital mole is a mole that is already present when a baby is born. 4. Acquired mole appears later after birth and is at risk of developing into melanoma. 1. Junctional melanocytic mole are raised and dark. 2. 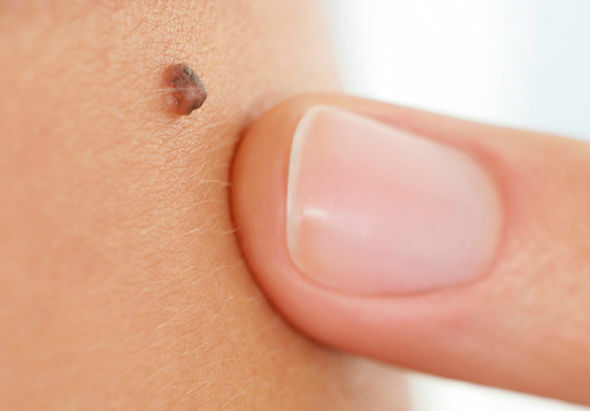 Intradermal mole has a color that blends with the skin. 3. Compound mole exhibits both qualities. 4. The halo mole has a ring of skin around it. Moles that are normal do not need to be removed. But if it’s bothersome for the person, it can be removed either through surgical shave or excision. Cancerous moles should be examined through biopsy. 1. Assymetry – half of the mole is different from the other half. 2. Border – the borders are not defined and are irregular in shape. 3. Color – the mole has different, uneven colors. 4. Diameter – typical moles should not be wider than 6 mm in diameter. 5. Evolution – a mole looks different from the rest in terms of color, size and shape. Melanoma is one type of skin cancer and commonly manifests as moles on the chest and back. Cancer begins in the melanocytes and can spread to the tissues if not treated early. You should go to a doctor if you see any changes like those five listed above or if the mole has lesions, bleeding and is lumpy, scaly or itchy. Melanoma can be treated using surgery, chemotherapy, radiation, immunotherapy and targeted therapy.